I’d be wise to trust a chef with four restaurants, a marquis spot on an Emmy award-winning show about food, and a glossy, celebrated new book. But when he starts asking a lot of me for only a simple bowl of grits, I start to reflexively push back. You want me to pay attention to the amount of time the corn spends drying in the field, Brock? The answer is yes, because the dryness of the corn will affect the cooking time. He’d also say that in order to deduce how much water and butter to add to my grits, I must understand the starch and sugar content of my corn. (The grits at my local store aren’t half that self-aware. If they don't know what they are, how am I supposed to?) He’ll mention that the corn is really best right after it’s milled, and he'll warn you not to use tap water. I broke those rules. My corn was milled eons ago, for all I know, and my grits were instead perfumed with the tap terroir of New York City. It’s not spring water from the verdant hills of Appalachia, but I didn’t have time to track that down -- I was too busy watching the corn dry in the field. And yet: Brock wins. Separate his method from his missive, and you’ll make yourself the best bowl of grits you’ve ever had. This is, according to him, how to cook grits like a Southerner, and he starts his lecture by shattering everything you thought you knew: that because grits are synonymous with comfort they should also be synonymous with excess. His version is impervious to this kind of transitive relationship. In his world, more doesn’t make them more -- it makes them less. Brock is going to make you practice restraint, which is to say he’s going to request you put away the parade of milk fat you usually call on (milk, cream, cheese). 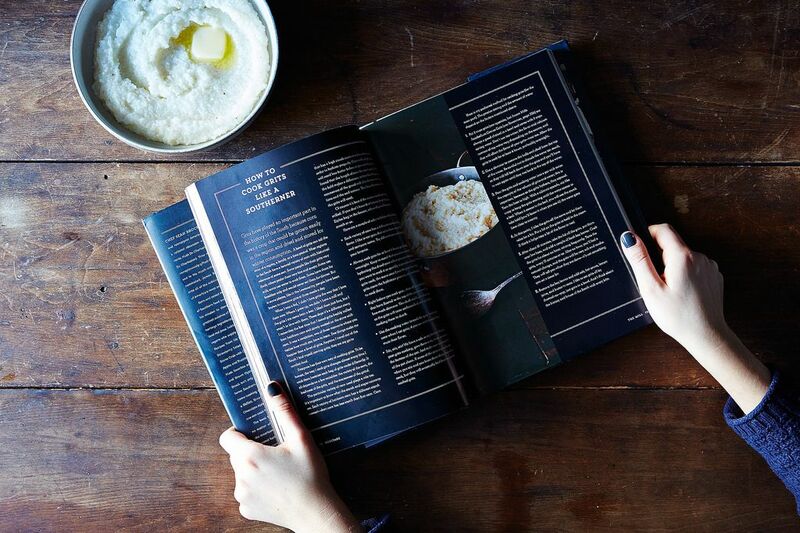 Pull from your pantry in their stead one lemon, a few bay leaves, and a mess of grits. (I concede that you should find the best ones you can, but failing just-milled, heirloom corn, whatever’s on your shelf will still benefit from this method.) The austerity of this scene, something like a Depression era still life, will make you feel initially sad. 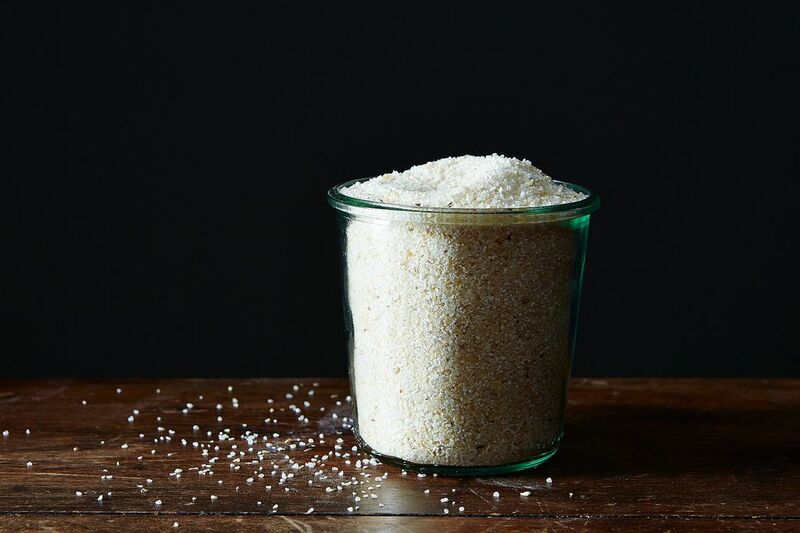 Power through: You have some soaking to do, and this will be your grits’ saving grace. Submerging the grits in a tub of water for a long soak (at least 6 hours) starts the hydration process in advance of the cooking, which enables the grits to cook faster and hold onto a little more of their corn flavor. Brock is going to give you grits that actually taste like corn, and this is step one. Then you’ll quickly skim for errant hulls and chaff, and dump all of this into a large pot over high heat. The soaking water becomes the cooking water, and that's a good thing, because by this point it's basically eau de corn. But you’re not done mollycoddling: After your large vat of hot corn water boils, you’ll cover it, take it off the heat, and let it “relax” for ten minutes. Newly rested, you can nudge it back over low with a few bay leaves to finish cooking. Brock calls for you to stir with a silicone spatula, and again your angst will resurface. Up until you decided to try it his way, your grits worldview included only tough love -- hearty, simple food is not the food you’re used to sheltering. Humor him anyway: I fell into a trance gliding mine along the bottom of the pot and then folding the grits back onto themselves in big, swooping half moons. I started to feel relaxed. I might have whispered a sweet nothing. Brock’s poetry was starting to make sense. And so were his grits: When they’re tender (“shhh, he coos, “they will tell you when they’re done”), you pluck out the bay leaves and stir in a pinch of salt, a squeeze of lemon, and a knob of butter. (Be gentle: A knob does not mean a half a stick.) 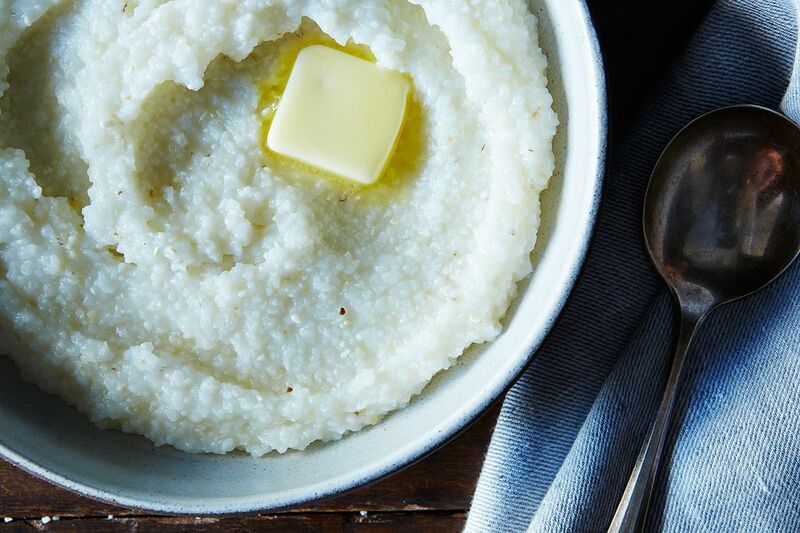 At this point you’ve given these grits a lot of yourself; you’ve sourced and soaked and stirred and shielded them through the whole cooking process. Now they’re going to give back. Care for them, and they will care for you. Serve yourself a big bowl of grits that, barely seasoned, taste more like themselves than they ever have. There’s no dairy to muffle the rally cries of the corn you just soaked and slow-cooked. You can almost see the corn field; you can almost taste their starch and sugar content. The bay makes them slightly heady, the lemon, present. If this is how they do it down South, I’m all in. Excuse the ignorance but.... what are grits? I'm in the UK, so are they like coarse polenta?!? In the most basic definition, yes. Though grits are made from ground hominy corn ( aka soaked in lye ) and polenta is not. Polenta is prepared from ground cornmeal and is yellow. 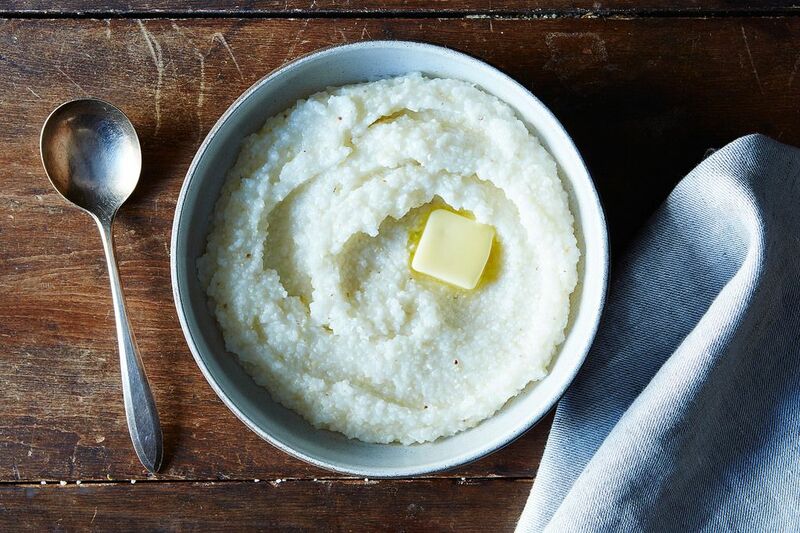 Grits are white. Grits are served hot from the pot and not baked, fried or grilled like polenta on their first outing. Leftover grits are often pan fried later that day or the next morning. My mom and dad were stationed in Alabama for some years and the southern gals their taught my mom to soak them over night so Chef Brock's way was not different to me, it is the way I learned to do it. I had a terrible day Friday and decided to make these grits when I got home from work. I stood there at the stove for an hour, stirring myself into a trance while drinking a margarita. They were, by far, the best tasting grits I've ever had. The simplicity made me so...so...happy. I made a little etouffee to go on top with chicken for me and tilapia for the husband. What made me even happier was the leftovers :-) I even sought out grits from a grist mill in TN while we were on vacation a few weeks ago just so I could make this. I lived in a country with no corn for three years ( India ) and when I moved back to the USA I couldn't get enough of corn products. I accidentally bought fancy heirloom grits and found them to need soaking because they were so coarse (a little annoyed because I was impatient) . They turned out to be so much better than any I had ever eaten;until then ,grits were grits. Anyone who thinks something this simple is worthy of adoration ,is okay in my book. I understand. I also understand history, tradition, and personal preference but I see no blasphemy here. He says to honor the ingredient and enjoy. isn't that the current mantra?Thanks Kenji. I soaked some grits overnight (ain't no thing) and cooked them according to Sean's recipe this morning. Damn! I suspect Eudora Welty may have had grits like these in mind when she said "Never think you've seen the last of anything". I will most definitely be making these again. p.s. I used Rich Pouncy's Bumpy Road Farm 100% non-GMO heirloom corn grits. I was skeptical about the bay leaves but I really like the way they combined with the lemon and butter. Thank you Kenzi. I agree with Sean that it's important to start with grits from a trusted source. If you don't do this, I promise you, you're really missing something. As for the rest of the recipe, it looks pretty straightforward to me. I can't wait to try it. To all ye nay-sayers, Chef Brock, author of this recipe, is a Southerner by birth, has devoted years to studying the traditional crops, livestock, and food preparation methods of the South, and strives to bring out the essence of these heirloom ingredients in his cooking. Rather than a high-falutin Yankee-style "middle finger" to your mama's grits, I see this recipe as a love letter to the flavor of heirloom corn itself. Brock's trying, in my estimation, to create a platform for that "simple" corn flavor to be appreciated in all its subtlety. Soaking grains really does amplify their flavor, not to mention unlock nutrients. For those who interpret Brock's reverence as no more than effete fussiness, I'd argue you're really just overwhelmed by the idea that one of your tastiest convenience/comfort foods could be elevated by an hours-long, cheese-less preparation process, and I feel you. Aren't you just an arrogant little better than all of us. My apologies, Food52 is no place for that type of comment. Knee jerk! We are all allowed our opinions. I think you're completely right in your assessment of the comments, Overmedium. Brock is a genius. These people don't want to taste the grits. They want to taste the cream and cheese they're accustomed to putting in their grits. To all the nay-sayers, Chef Brock, author of this recipe, is a Southerner by birth, has devoted years to studying the traditional crops, livestock, and food preparation methods of the South, and strives to bring out the essence of these heirloom ingredients in his cooking. Rather than a high-falutin Yankee-style "middle finger" to your mama's grits, I see this recipe as a love letter to the flavor of heirloom corn itself. Brock's trying, in my estimation, to create a platform for that "simple" corn flavor to be appreciated in all its subtlety. 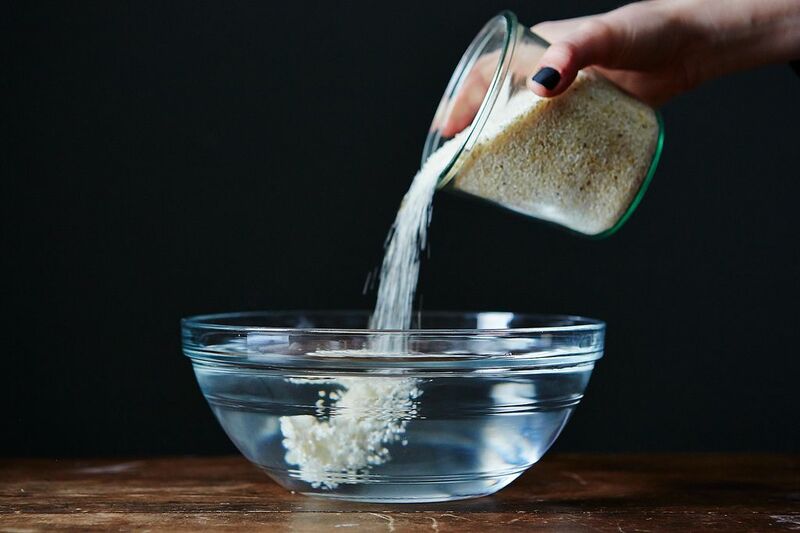 Soaking grains really does amplify their flavor, not to mention unlock nutrients. For those who interpret Brock's reverence as mere effete fussiness, I'd argue you're really just overwhelmed by the idea that one of your tastiest convenience/comfort foods could be elevated by an hours-long, cheese-less preparation process, and I feel you. Grits are like biscuits; overthinking them is a mistake. To be fair there are a lot of damn fools who do the same with oatmeal. Never mind the twee recipe. It's that headline and sub-headline that's got all us Southerners' dander up more than anything. I could say a lot more but I'm hearing my mother in my ear, versus Olympia Dukakis in "Steel Magnolias", reminding me about being nice. ;-) The writing is excellent, the dismissive tone not so much. I'm not protesting this tedious method, and I may even try it the next time I become bored. However, this does remind me of a time, many years ago, when I first learned to cook Basmati rice from a serious Indian cook book. It required multiple, "necessary" steps including rinsing, boiling and baking. I did it that way for years until my Pakistani friend told me she just puts it in her rice cooker. What did I learn? There's more than one way to cook anything, but the truth will set you free. Hey....have you tried cooking grits in your rice cooker? I'm betting something great might happen. Lol... Ummm, Can I help? Kenzi, I also liked this article. Your writing is excellent and I always like learning new ways of making delicious creations, even if I have a method I really love. Looking forward to trying this with home-milled Plymouth Flint from my Pioneer Valley Grain Share. Thanks! 1. Pour grits in pan. Eyeball the amount you think you'll need. 2. Run some cold water over them to rinse them off. Pour off the water. 3. Add water to cover the grits a little. 4. Salt them. This is the tricky part. You have to get the salt right while you're cooking them because if you don't, you'll never get them right after they cook. 5. Put the on the stove on medium and let them cook. When they start boiling (or baw-lin as my mother says) turn the heat down to low, stirring every so often. 6. If the water gets down too low, just add some more water. 7. Once they are cooked (not crunchy when you chew them) you can leave them on low until the rest of breakfast is cooked. They won't overcook. Just keep adding water when they get too thick. 8. Eat with butter and/or cheese. Yum. 9. If you have leftovers, put them in the fridge and the next morning make them into patties and fry them up. In bacon grease. I like them with Georgia Cane Syrup. But most of you would probably prefer maple if you've never had Cane Syrup. Cane Syrup is in a class all its own. Darlin', you couldn't have said better. The headline is positively inflammatory! Anyone ever fry liver pudding to go with their buttered grits and fried eggs? It wasn't my intention to be inflammatory! I just wanted to represent these grits the way Brock himself does. The headline in his book reads: "How to Cook Grits Like a Southerner." That said, this is really making me think -- I had no idea that grits were so divisive. This is the kind of food controversy I can get behind. It's not you Kenzi, it's pretentious chef's who take something so simple, so good, so much a part of the South and turn it into something it's not. It's his "How to cook grits like a Southerner" that is inflammatory. His grits may be delicious but they're not traditional and they're not cooked like any Southerner I know, bless his heart. You may find them at his restaurants, but you won't find them at Waffle House. Amen to that. Over-thought, over- done and over pretentious. I am a Southern born chef and can't agree more with the rest of my fellow southerners that this guy is delusional and his recipe for boiling water must be 4 pages long. We are just not that complicated down here. So tired of chefs from everywhere but the South trying to capitalize on the current popularity of our cuisine and doing exactly this to our heritage foods. Yes you can cook grits like you would dry beans. Easy enough?!? Cause that's how we really roll down here. And also agreed, Kenzi is a delightful writer. You won't find then at waffle house because waffle house uses instant grits. Gimme a freaking break. Comparing just about anything to Waffle House is a joke. Waffle house is fine, but it's not real southern food. Grits with eggs over easy with a dash of Tobasco, crisp bacon, and buttered toast made a regular appearance on our breakfast table while I was growing up in New Orleans decades ago. Later, they became the basis for Christmas morning casserole, incorporating sausage, chiles, cheese, etc. sometimes I add some milk, always butter, and I agree that stone ground grits are superior. I might try this method, but am happy with my own way, and with the result. That's a very good point. Vive la difference! I generally find the "this is how real southerners do it" argument to be annoying because it immediately alienates anyone who does it differently. The South is a very large place, and there are all sorts of people who live there, and a lot of them cook the same foods in very different ways. This is more of a critique of the Brock recipe than Kenzi's article--it's a great article, and I am most definitely going to try Brock's method, but generalization makes me squirm. Also--there is almost always more than one path to the desired end. Thanks for the nice piece, though, Kenzi! It's definitely a technique worth trying. lydia.sugarman, thanks. It's all a matter of taste. You should seriously try my recipe. My mother's side was from Augusta, GA, and my father was Argentinian, but I grew up cooking soul food and Puerto Rican foods. I learned to cook as a small child, hanging around the kitchen with my great grandmother, my grandmother, and my mother. I just watched and eventually, they enlisted me to help. I've since enhanced some of their recipes and others, I've left alone. That said, yes, we used salt and water and butter in grits growing up, but I put my spin on them and found the half & half makes them creamy and the cheese turns them into either cheese grits, depending on your cheese or polenta. I've serve grits with Parmesan & butter under porterhouse chops, under roasted chicken, etc. Linda Maria, for the most part, Southerners' grits is a simple dish, grits, water, a little salt. The only addition is butter after it's served. I tried making grits *once* with milk or cream, I don't remember. Bleah! I want to taste the corn along with my eggs and breakfast meat.